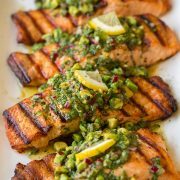 Grilled Salmon with Creamy Pesto Sauce is an easy weeknight salmon recipe that is brimming with flavor! 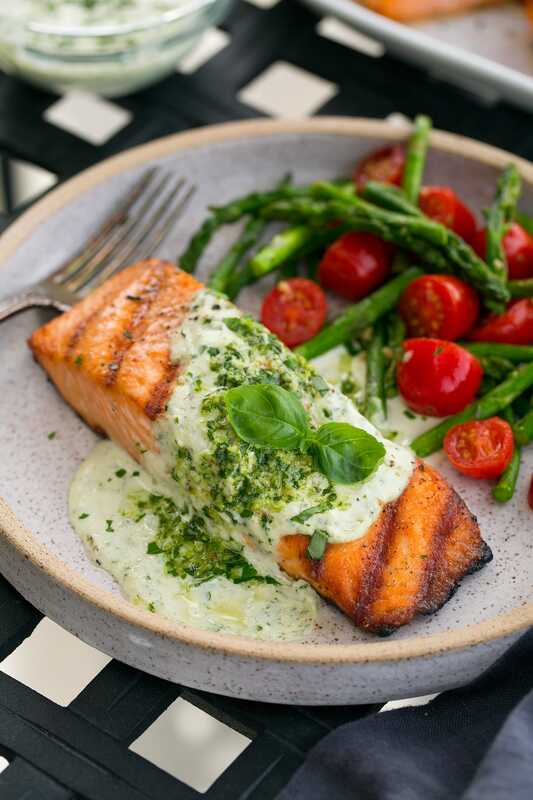 Salmon fillets are cooked over a hot grill for a nice light char, then they’re covered with an easy cream cheese based pesto sauce. So good! Salmon + Pesto?? Yes! And then let’s make that a creamy pesto shall we? I am all about that salmon lately! What’s new though salmon has always been one of my favorite things to have for dinner. But honestly could they drop the price just a little? I love though when I make it at home I can feed four+ people for what it costs to buy it at a restaurant. 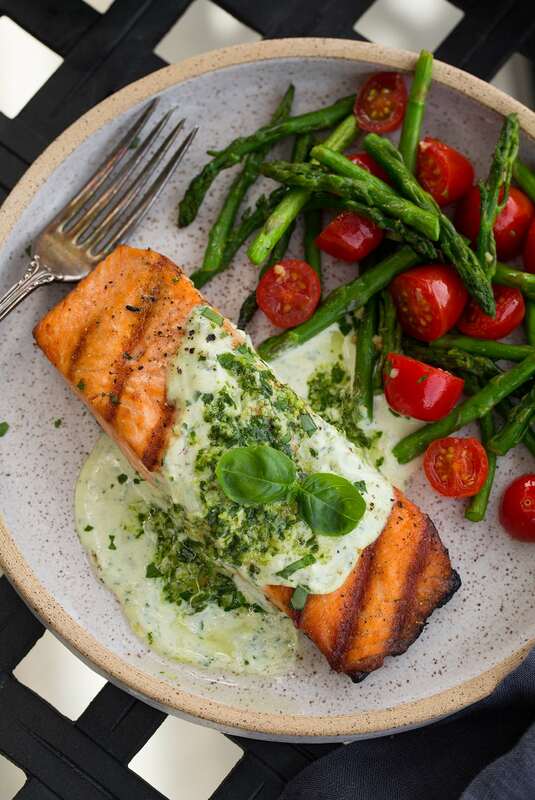 And this Grilled Salmon with a simple creamy pesto is just as good as what you’d buy at a nice restaurant! For this recipe I used homemade pesto because homemade is obviously best but store-bought will work here as well. Can I Cook it In a Skillet? Pat salmon dry with paper towels, season with S&P. 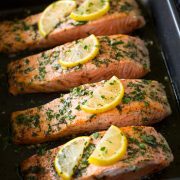 Cook the salmon in 2 tsp of olive oil in a 12-inch non-stick skillet over medium-high about 3 minutes per side. Have You Tried it with Low Fat Cream Cheese? And I’m yet to try this with Neufchatel cheese, I’d like to try it sometimes. I’m hoping it will melt as smooth and creamy as the cream cheese does without creating any type of roux first. But this version is oh so perfectly rich and creamy and simply delicious. I’m totally in love! Try it soon! Preheat grill. Brush both sides of salmon with olive oil and season. Grill salmon on oiled grates until just cooked through (note that it will continue to cook slightly off heat so I like to undercook slightly). Meanwhile melt cream cheese with milk in a saucepan. 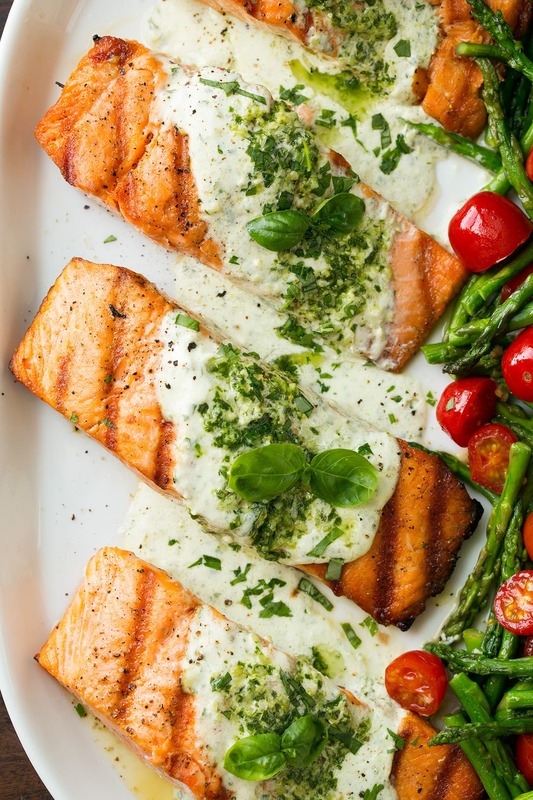 Serve salmon warm with creamy pesto sauce. 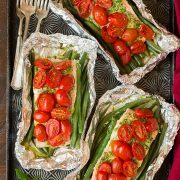 This is an easy weeknight salmon recipe that is brimming with flavor! 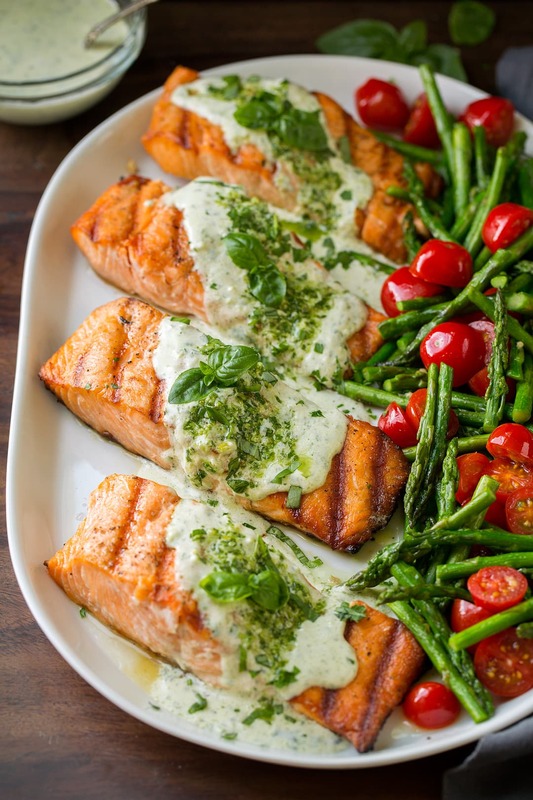 Salmon fillets are cooked over a hot grill for a nice light char, then they're covered with an easy cream cheese based pesto sauce. So good! Preheat a grill over medium-high heat to about 425 degrees. Brush both sides of salmon with olive oil (about 1 Tbsp total) and season both sides with salt and pepper. Brush grill grates with oil and grill salmon about 3 minutes per side or to desired doneness (if using skin-on salmon grill skin side up first). While salmon is grilling, heat cream cheese with milk in a saucepan set over medium heat, stirring constantly until melted, about 1 - 2 minutes. Remove from heat and stir in pesto. 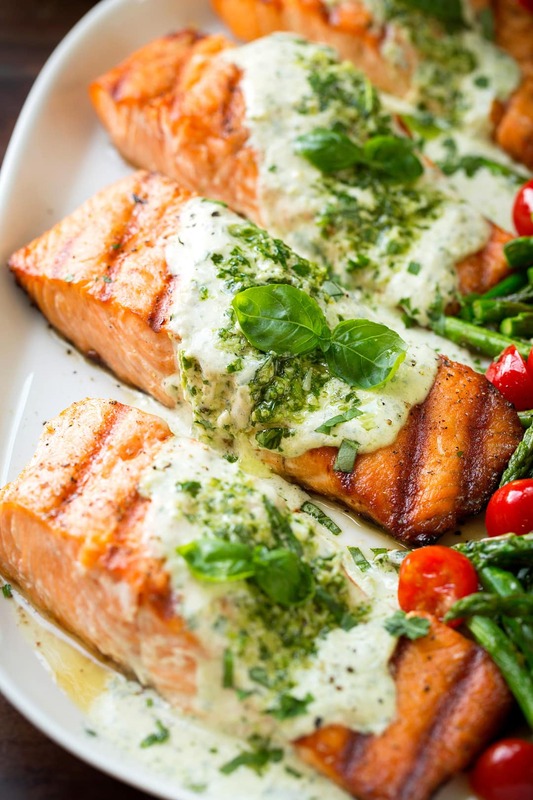 Serve salmon warm with creamy pesto sauce. Spoon about 1 tsp pesto over creamy pesto sauce for added color and flavor. For a homemade pesto (which you'll have just a little excess left): in a food processor pulse to mince 1 cup (18g) slightly packed fresh basil leaves, 1 clove garlic, 2 Tbsp finely shredded parmesan, 1 Tbsp pine nuts or chopped walnuts, salt and pepper. Pour in 1/4 cup olive oil and pulse until well blended. Store in refrigerator.